This is perhaps more an astrological than an observational instrument. It has all the necessary features for observation, such as an alidade and degree scale, but also all that is needed for correct astrological and calendrical predictions, such as the indications of dominical letters and astrological houses. On one side of the instrument there is a Regiomontanus-type dial, though useless without an arm. 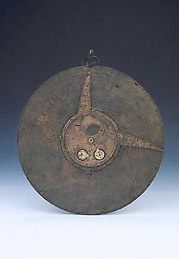 It is not clear whether the arm is presently missing, or the instrument is incomplete, or the engraved lines were meant to have another aim than a sundial.